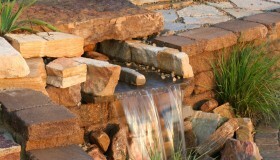 Drainage is often the #1 concern when beginning the design process. While an important resource, water can be the source of many issues within your home and yard. Both surface water and ground water need to be properly addressed to ensure the longevity of your landscape and your home. Preserving and protecting our natural resources and maintaining the beautiful palette that we are blessed to work with is of the utmost importance to us. Controlling and managing rainwater within a site helps us do our part in minimizing the amount of sediments and pollutants that make it into our lakes and streams. The development of products such as permeable pavers and rain barrels, and concepts such as rain gardens and green roofs has changed the way we can approach this issue. We have the ability to harvest rainwater within a yard, utilize it or allow it to return to the ground water. CurbSide is proud to be able to offer eco-friendly landscape solutions.